From Film Chest Media Group comes Dark Film Mysteries is a collection of film noir classics available in a special three-disc DVD collector’s set. All have been issued previously in various incarnations and of varying qualities, but here they all are in one set! A genre that became a cinematic staple for American audiences during the mid ’40s through late ’50s, film noir is best known for stories featuring suspicious, male characters who maintain unsympathetic, doom-filled attitudes that manifest upon encountering a beautiful woman of questionable character. The femme fatale uses her sexuality to manipulate and maneuver her male counterpart into the unsuspecting fall guy for a crime—generally involving a murder. 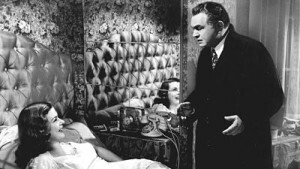 Shot in a low-key, black-and-white, gloomy style with roots in German Expressionist cinematography, these films showcase the dark, callous side of human nature and are filled with an oppressive atmosphere of pessimism, fatality and doom enhanced by shadowy characters and locations swirling with moody dialogue and cigarette smoke. Dark Film Mysteries features 16 hours (11 films) of classic noir cinema, including the great Scarlet Street (1945), Woman on the Run (1950), Quicksand (1950), Detour (1945), Inner Sanctum (1948), Kansas City Confidential (1952), The Stranger (1946), Fear in the Night (1947), The Strange Woman (1946), The Red House (1947) and The Strange Love of Martha Ivers (1946).